You're done reading about beard wash and shampoo, and now you want to pick some up. I mean, you were already washing your beard, but now you know exactly why you have to use a specifically designed beard wash. But you don't know which one to buy! Well you're in luck, because like always we've got you covered with our complete guide to the best beard washes and conditioners out there. Let's face it gents, if we could get through the day without any grooming and still look and smell good, we probably would, right? After all, the shower, shave and … time on the toilet is time not spent doing what we want to do. That's why if you're going to wash your beard, you're going to use the best product possible, so you get the best result in the quickest time. MY GOODMEN! The beards have come! Care for them with beard shampoo & conditioner containing my best beard oil! I declare your beard will look like a rabid mongoose no longer!MY GOOD MEN! The beards have come! Care for them with beard shampoo containing my best beard oil! I declare your beard will look like a rabid mongoose no longer! I MUSTACHE YOU A QUESTION GOODMAN. Do you tire of owning 47 different types of beard balm, beard shaper and beard conditioner? Well, I have a solution better than that Trojan horse idea. YOU MAY OWN A BEARD BRUSH, BEARD COMB, BEARD BEANIE AND BEARD TRIMMER. These will give semblance of taming your hairy holiness, but I do declare Polished Gentleman will give perfection! As a complete package, this is the single best beard wash set we've found. It's got both a shampoo and a conditioner, so you're set there and don't have to buy anything else. The ingredients list is comprehensive, and contains everything you need it to, including argan oil, which is rich in hair healing vitamin A and E, manuka honey, which is an antibacterial, antifungal and antiviral to clean out your beard and leave your skin absolutely pristine. Tea tree oil, eucalyptus and rosemary for more antibac properties, but more importantly for increasing blood flow and stimulating beard growth. Plus there's biotin, which is like a nitrous injector for your skin, supercharging healing, skin softness and nutrient absorption. Fully organic, ph balanced so it isn't gonna bring you out in rashes or eczema, and with a clean tea tree smell, this really is the complete package. BEARD CONDITIONER: A moisturizing rinse-out beard conditioner formulated specifically for your beard and mustache. SOFTENS: Softens facial hair with hydrating natural ingredients including Jojoba Seed Oil and Avocado Oil. MOISTURIZES: Pro-Vitamin B5, Aloe Vera and Dragon's Blood moisturize the skin for healthier, more elastic skin. Zeus make classy beard products, and this beard wash is no exception. Packed with vitamin B, aloe vera and dragon's blood for clear and healthy beard and skin, and jojoba and avocado oils for softening rough beards and dealing with the dreaded beardruff, regular use of this conditioner will soften up even the roughest of beards. We definitely noticed the difference. Just a few washes is enough to get your beard tamed and it stays that way for pretty much the whole day, save a freak windstorm or someone intentionally getting up in your facial hair. She smells great too, a subtle lime scent. As a man who loves the smell of citrus, this was a welcome addition. An excellent beard conditioner that is a strong conditioner, set to control even the toughest of beards, whilst leaving your beard smelling clean and fresh. The peppermint doesn't just smell good, either. It legitimately makes your beard look and feel sleeker and shinier, so for dull and tired looking beards, this is is an excellent choice. The conditioner also contains burdock and fenugreek, which keep skin and hair nourished and healthy. The only real criticism? The smell, whilst I love it, is intense. Some guys might not get on with it. But that's fine. That's why we have unscented beard washes, right? With a clean, old timey smell like a real man's barbershop, using this conditioner will send you back to the times when every man wore a hat, every woman had a bob hairstyle and every child was smoking cigars by the age of seven. I kid, of course. But seriously, this is a gorgeous wash that's jam packed with 100% natural ingredients to soften and condition your beard, including shea butter and coconut oil for soft, hydrated skin and beard, B vitamins for exceptional hair health, plus more exotic ingredients like nettle and marshmallow root. Unlike a lot of other conditioners, this one comes in a pot and is more of a balm. In my opinion this is a great choice because it makes it real easy to apply, and you can slap it on before you shower, leave it for a few minutes, then jump in and rinse it out to leave your beard soft and supple. Can also be used on your hair, what's good for your beard is also good for your hair! It was Beardsley that created and sold the first beard specific shampoo, all the way back in 1993, so it's fair to say they've got all the experience they need. That means you can trust in their products, as they know what they're doing. This beard conditioner reflects that. As a conditioner for dealing with dry, dead skin and beardruff it's fantastic, working to clear it up in as little as a couple of uses. It's also great for beards, softening and controlling even the most errant hairs quickly, and leaving your face feeling soft and looking sharp. Lastly, it's got a berry scent that's pretty strong, but pleasant, if you like that sort of thing. Overall, it's a great purchase, especially if you need a beard conditioner that's going to cure your dry skin now. GROW YOUR BEARD QUICKER, FULLER, AND TAMER - Carefully chosen natural oils moisturize the beard, facial hair follicles and pores to stimulate beard growth and thickness for a refined, polished and seductive look. Helps your beard grow faster and thicker. TARGET THE PORES, NOT JUST THE HAIR - Most products, like balm, only target the hair itself and do not focus on the most important part of your beard: the hair follicles and pores. 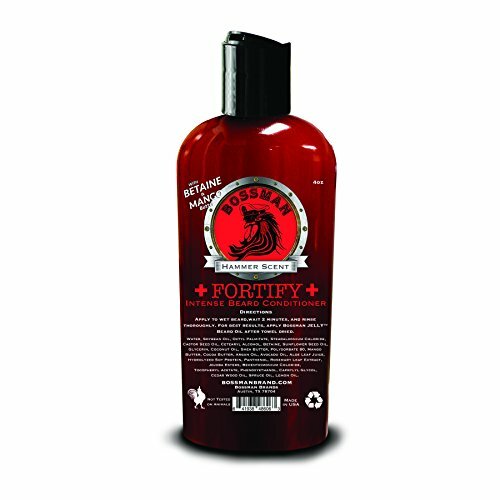 Bossman Brands' Fortify Conditioner cream contains moisturizers and natural oils that target the beard at its source to create a healthier base which in turn creates a fuller and more mature looking beard. 1ST OF ITS KIND TO USE BETAINE - Betaine is an amino acid that occurs naturally in beets. The chemical structure of betaine makes it the best candidate to aid in moisturizing the growing beard because it easily attracts hydrogen atoms and creates that silky-smooth feel for all beards including black, red, brown, and white beards. Bossman beard conditioner is the first beard beard conditioner to use betaine, an amino acid that's naturally found in beets. Why is this important? Amino acids are the building blocks of proteins. The same proteins your beard hairs are made from. Betaine is effortlessly absorbed by your beard and aids in binding hydrogen atoms to the structure of your hair, leaving them stronger, less likely to break, and looking and feeling sleeker. There's also the ubiquitous shea butter and coconut oils for clearing up dry skin, plus a whole list of other beard strengthening and nourishing ingredients. Supposedly, this conditioner is also good for healthy pores, which is obviously great as it means you're treating the beard right at its source. Whilst I can't confirm this because I'm not a scientist, I know that I felt good using this conditioner. 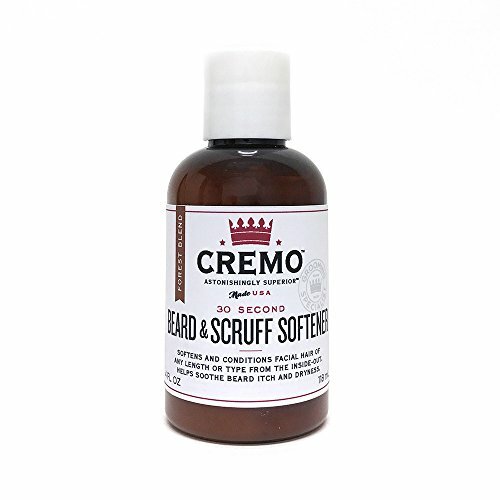 Cremo Scruff make highly regarded beard products right here in the USA, and their shaving creams are seen as some of the best out there. Their entry into the beard wash market is a smart play as its all natural and works incredibly fast. See, a lot of cheaper beard washes have silicones as part of their formula. Silicone bonds straight to the hair, which makes it feel really smooth in the short term. But this is like coating a gear with WD40. Whilst it's still coated in the lubricant, it's gonna feel smooth, soft and slippery. But what happens as soon as you wash it? That's right, it goes right back to how it was. So what's different here? Instead, this conditioner has an all natural ingredients list designed to strengthen hair as it grows, so your hair is stronger today, tomorrow and every single day. The only downside I could find with this? The bottle. It's rock solid, which means getting at your beard wash can be a struggle. Part of the fun though, right? Aloe vera is fantastic for beard and skin health. It's amino acid dense, which are the compounds that make up your hair, and it's this reason that it's used for hair growth and as a hair loss treatment, not just for cleansing and conditioning. What this means is that if you've got a thin, scrubby beard or you're getting patchy, this wash will actually stimulate new growth amongst your beard, and should leave it looking denser and thicker than ever. On top of this, it's actually a really great cleanser. Nothing artificial means no toxins in your beard, and aloe vera is a natural moisturizer and antioxidant that’s used to treat everything from sunburn to dry skin. Whilst it might not have the list of ingredients of other beard washes, that's not important when it does what this does. Sometimes a man wants to smell good, especially when he's going through his daily cleaning ritual. In these cases, a beard wash with a pleasing scent is what's asked for. The four below have varying scents, but they all smell fresh and masculine, and will leave you feeling and smelling smart all day. Number one in our scented beard wash list, the smell of this conditioning wash reminds me of sitting in the barbershop when I was five years old, watching my dad in the chair chatting to his barber whilst he had a shave. On top of the nostalgia, this wash is full of good things, including shea butter and coconut oil for soft, hydrated skin and beard and B vitamins for exceptional hair health. There's also nettle and marshmallow root, which are full of important vitamins and minerals that boost skin and hair health. A lot of beard washes, or shampoos in general, smell really artificial, which even if you don't care about using organic, can be really off putting. This conditioner fixes that, with a soft but distinct lemon scent that will stick with you throughout the day without being overpoweringly strong. Zeus beard products are also known for being solid, excellent products no matter what you're buying, and this wash follows that trend. It leaves beards feeling rehydrated and clean, plus the vitamins and nutrients in it are great for hair health, as well as leaving the skin under your beard soft, supple and inviting. Our top pick from every beard wash out there, Polished Gentleman's beard shampoo and conditioner package also smells really good, with the scent of tea tree oil without the eye burning harshness that normally comes with it. It's not just sweet smelling, though. As a wash it's got a list of ingredients that will leave your beard refreshed and silky soft, including eucalyptus, rosemary, manuka honey and biotin, which as a group have a host of antibacterial, antifungal, blood flow increasing, skin healing properties. It's also fully organic and ph balanced so you can feel great about saving the environment whilst you clean your face, and it's not gonna bring you out in rashes or eczema if you're particularly sensitive. One of the strongest smelling conditioners I've found, Bluebeards leaves your beard smelling of peppermint all day long, so if you're looking for a fresh, day long scent, this is the choice of champions. For washed out beards, this is is an excellent choice because the peppermint oil doesn't just smell good, it also makes your beard look and feel sleeker and shinier. This conditioner also contains burdock and fenugreek, which keep skin and hair nourished and healthy. It is a really intense smell, though. If you want the most intense smelling beard conditioner, you know what to do. Go Bluebeards and be a pirate. There's really only one choice for unscented beard washes out there, and that's the Green Leaf aloe vera wash. Any others we saw just weren't up to the standard, and it didn't feel right to recommend them. So if you need an unscented beard wash, this is what we'd recommend. 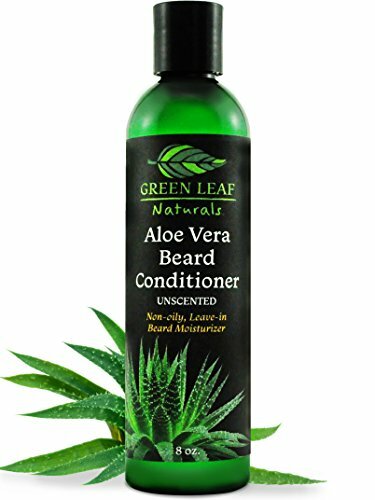 The only unscented beard wash we could find that we trusted, Green Leaf Naturals is almost 100% aloe vera oil, and completely skin safe. Aloe vera is used all over the world for skin and hair health, and it's been used for literally thousands of years. Even the Egyptians knew what was up when they were rubbing this stuff on their mascara'd up faces. It's also a natural cleanser and antibacterial, so you can feel safe rubbing this into your beard knowing it's killing anything that might be lurking. Not only is aloe vera great for beard health, because of all of the amino acids in it, it also actually encourages hair growth, so for guys with thinner beards who want more, this is a legit choice. If you're washing your beard to keep it clean and toxin free, you don't want to be adding more chemicals to it. That's why in our opinion the best beard washes are organic and all natural. 100% natural ingredients make this the premier choice if you're looking for a fully organic beard wash. It smells great, cleanses and hydrates tired faces punished by long days, and leaves beards looking and feeling far better than before. Shea butter and coconut oils repair dry skin and clear up beardruff completely, and a wealth of vitamins and nutrient packed plant extracts make sure that your beard is going to look smoother and more controlled and feel far stronger than ever before. It also comes in a tub, designed to be used before you shower rather than in it, which is great. I found myself slapping this on, then brushing my teeth or doing the morning duty whilst I waited for it to settle, then just jumped in the shower to rinse it out and leave my beard conditioned and huggable once again. Another fully organic beard conditioner, Zeus beard conditioner wash was featured earlier in our top picks, so you know it's a legit choice. As a conditioner, this wash is full of goodness, including beard softening jojoba and avocado oils and skin moisturizing vitamin B, aloe vera and dragon's blood herb. It smells really attractive too. A fresh and smart lime that's noticeable without being too strong. As a wash, it's pretty damn good. It left my beard feeling clean, there wasn't any appreciable oiliness, and I really appreciated the smell throughout the day. 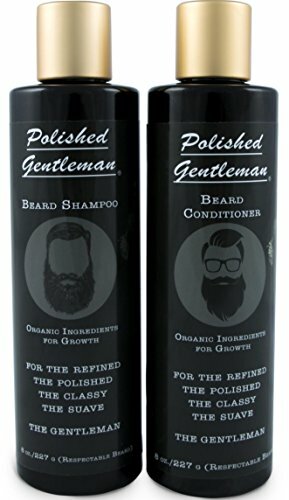 Polished Growth's shampoo and conditioner is absolutely fantastic, it cleans your beard without stripping it of it's natural oils, while also giving it a good biotin boost and adding many more nutrients. After a wash with Polished Growth's shampoo and conditioner your beard will feel like new! We love it for those reasons and many more. 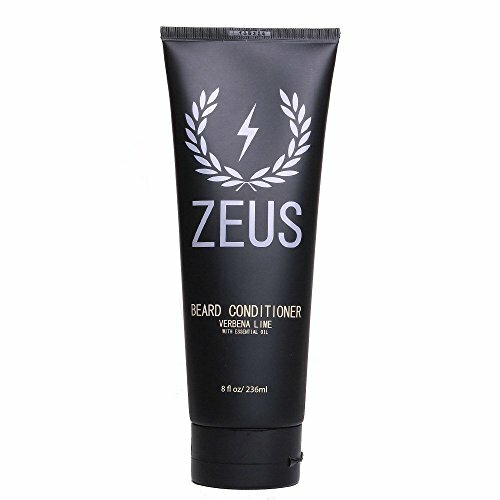 Zeus's beard shampoo and conditioner is absolutely fantastic, it nourishes your beard with every wash, one thing that stood out to us is the amazing lime scent. The scent is so good, well it's good enough to eat, it's also quite refreshing first thing in the morning. 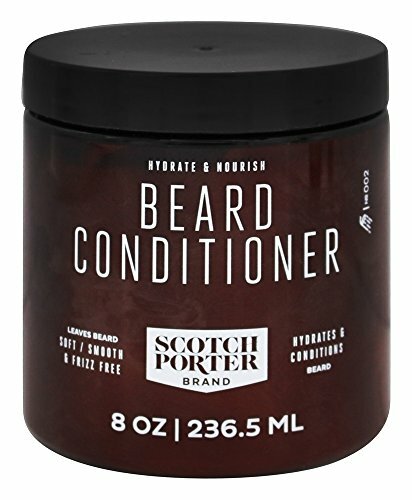 Scotch Porter's beard conditioner is an amazing choice, and don't be put off by the fact this is in third place, this is an amazing beard conditioner wash, for us the issues were price and scent, but the price is due to being entirely natural, there aren't any chemicals in this beard shampoo and conditioner wash.